On this page, you will find information on some of my past and present research projects. Please refer to the publications tab above to see a full list of my publications and presentations. Climate variables obtained from global models are too coarse in resolution to represent smaller scale interactions among processes and to assess impacts of climate change at regional and local levels. I downscaled global model projections using a well-established regional climate model to generate high resolution climate projections and to assess 1 ) changes in mean and extreme climate 2) potential impacts of climate change in regional and local scales. 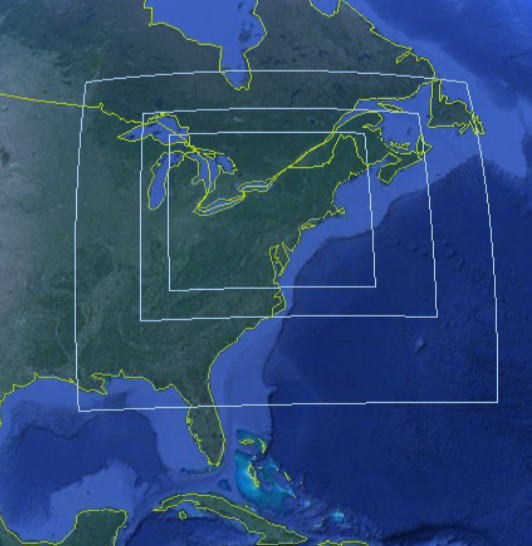 I used Weather Research and Forecasting Model with three nested domains (27-9-3km) and a convection resolving approach to obtain climate variables at 3 km horizontal resolution saved at hourly intervals for three time slices (2006-2020, 2040-2060, 2080-2100). I used a unique WRF model setup and obtain improved historical precipitation rates and temperatures. The resulting climate dataset (~2 Petabytes, 3 km horizontal resolution climate projections, including more than 200 climate variables saved hourly for 55 years are available for public use). See Komurcu et al., 2018 for details, i.e. 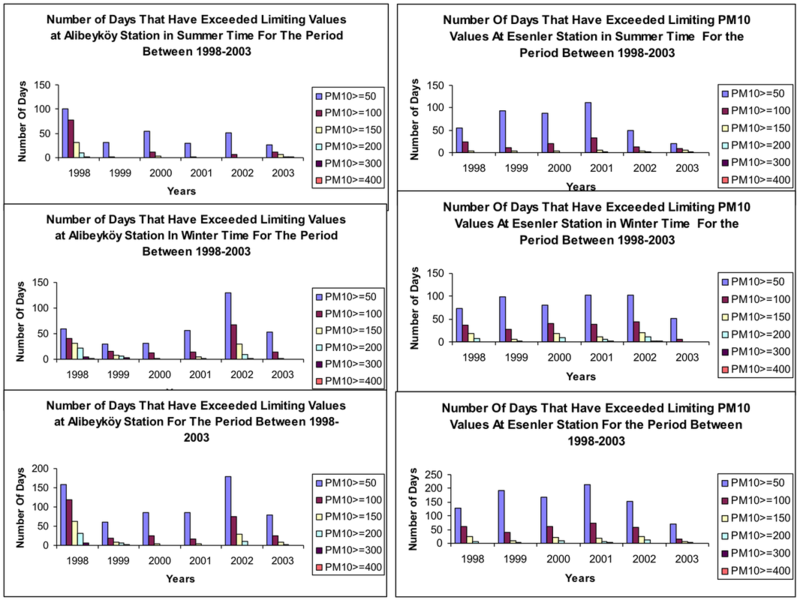 comparison with historical observations and reanalysis; CESM vs. WRF projections. Check out the Climate Projections tab above to see projected changes for the Northeastern U.S. I completed all simulations on NCAR's Yellowstone High Performance Computing System utilizing a 12 million core hour allocation granted to me for this work. ​M. Komurcu, M. Huber, "A New Dataset to Analyze Extreme Events in New England", 41st NOAA Climate Dynamics and Prediction Workshop", Orono, ME, October 5, 2016. M. Komurcu, Using High Resolution Modeling to improve sustainability in New England, National EPSCoR Meeting, Portsmouth, NH, November 2015. M. Komurcu, R. P. Acosta, J. Buzan, M. Huber, Simulating Regional Climate Change in New England, AGU Fall Meeting, San Francisco, CA, December 13-20,2014. M. Komurcu, R. P. Acosta, J. Buzan, M. Huber, Dynamical Downscaling and Model Calibration for Simulating Regional Climate Change in New England, New Hampshire EPSCoR All Hands Meeting, Concord, MA, November 19, 2014. While general circulation models (GCMs) are widely used to project future changes in climate, there are significant disagreements in simulated cloud phase (ice vs. liquid) among different models. Clouds affect the energy at the Earth's surface, warming/ cooling rates of the surface and this radiative influence depends on the phase of the clouds (and number concentration and size of the cloud particles in each phase). I led the FIRST inter-comparison of cloud water phase among different GCMs. We found that simulated cloud liquid is under-predicted compared to satellite retrievals. 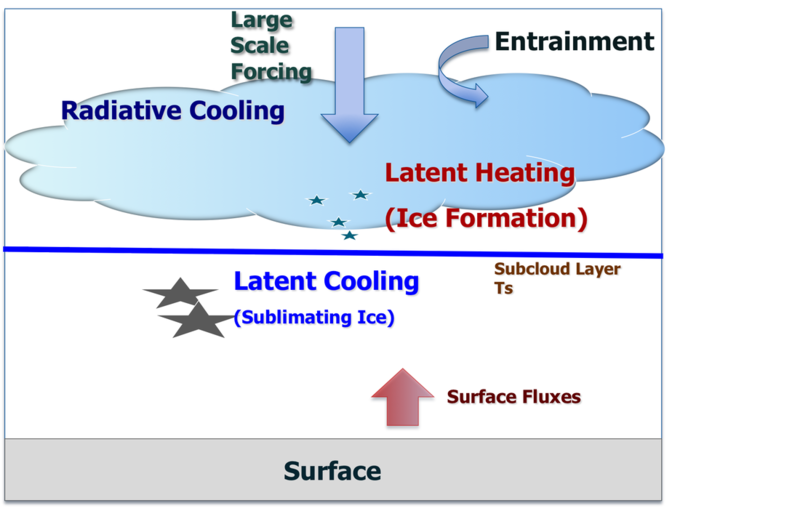 Based on sensitivity tests, results of this work show that cloud microphysics parameterizations affecting phase (ice vs liquid) of the cloud particles (i.e. growth and fall out rates of particles) need to be improved. I studied interactions between cloud microphysics and dynamics lead to persistent clouds in the Arctic that can last for several days and affect the radiation reaching the surface (hence potentially affecting the recovery/melting of the underlying sea ice surface, in turn the regional climate). During transition seasons, Arctic clouds can be of mixed phase (cloud particles are composed of both ice and liquid phases, and both phases coexist). I investigated the interactions between cloud microphysics and cloud dynamics that lead to persistent clouds in the Arctic using large eddy simulation modeling and sensitivity tests on ice nuclei concentrations, ice formation mechanisms, growth and precipitation rates of ice crystals. Komurcu, M., 2015, Influences of Ice Crystal Number Concentrations and Habits on Arctic Mixed-Phase Cloud Dynamics, Pure Appl. Geophys., doi: 10.1007/s00024-015-1132-8. 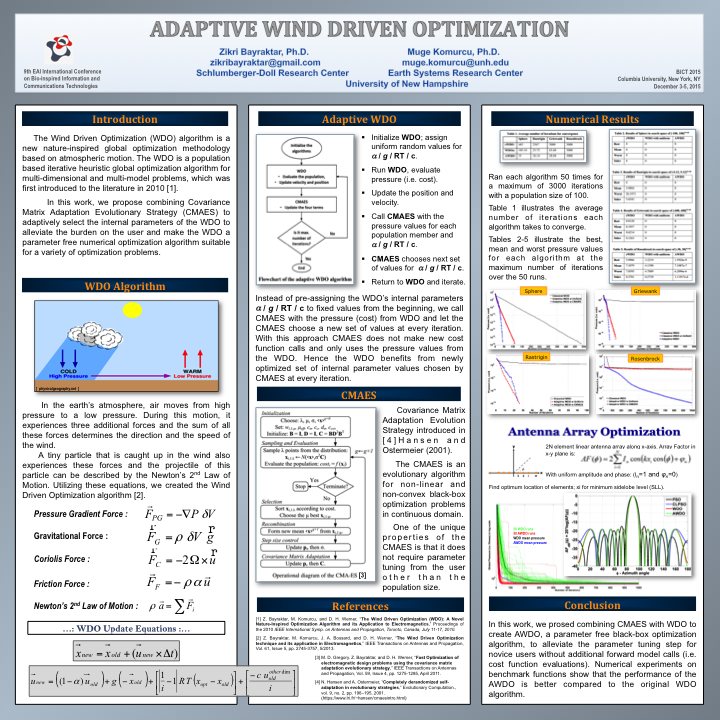 Z. Bayraktar and M. Komurcu, "Adaptive Wind Driven Optimization," Proceedings of the 9th EAI International Conference on Bio-Inspired Information and Communications Technologies (formerly BIONETICS), New York City, NY, Dec. 3-5, 2015. ﻿Characterizing pollutant emission sources, pollutant transport via atmospheric advection is essential for Turkey to comply with the European Union directives on pollutant emissions and legal limit pollutant concentrations. This study provides a categorization of pollutant sources and their transport in Turkey utilizing various observational sites measuring different pollutant concentrations. Selected Publications: (Please see publications tab above for more publications/presentations on this research). Muge Komurcu, 2004, Bachelor's Thesis, Characterization of Pollutant Sources in Istanbul using PM10 and EU Directives. Kadir Alp and Muge Komurcu, Characterization of Pollutant Sources in Istanbul with PM10 and EU Directives, International Journal of Environment and Pollution, 2009, Volume 39, No.3/4, pp.204-212. Using the Mesoscale Meteorological Model (MM5), older generation of WRF, I studied effects of lateral boundaries and horizontal resolution on simulating flood events in Istanbul. Heavy precipitation events in Istanbul produce costly damages to houses, businesses and infrastructure and are are challenging to simulate/predict because the events are highly localized due to varying steepness of the local topography and the circulations affecting the Bosphorus region. Click on the image to see the animation. ​Muge Komurcu, 2005, Master's Thesis, Effects of Lateral Boundaries and Resolution on Flood Simulation: A Case Study of Istanbul. Phases of The North Atlantic Oscillation (NAO) has different consequences on temperatures, circulation patterns and precipitation affecting Turkey. 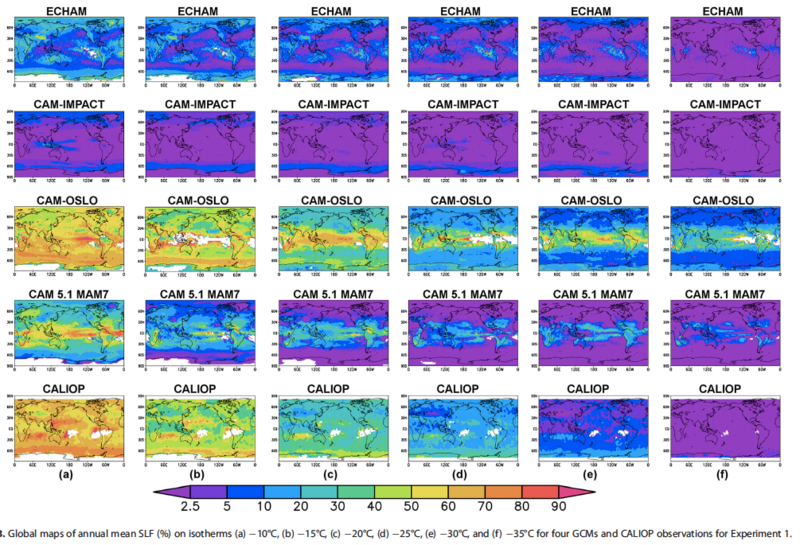 To prepare for future changes in climate variables due to climate change, it is essential to identify changes in climate variables in past and current climates as a result of the changes in the phase of the NAO. This study identifies statistically significant changes in climate variables in Turkey with different NAO phases. ​Muge Komurcu, 2003, Bachelor's Thesis, Impacts of the North Atlantic Oscillation (NAO) on the Climate of Turkey.